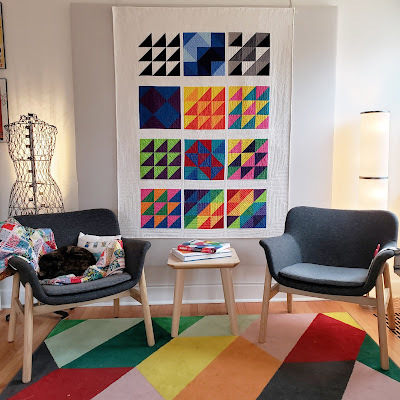 This quilt has been in process for over two years, and I just put the finishing stitches in it last night! These color harmony sample square blocks were made in February of 2017 for a post all about using a color wheel at weallsew.com. 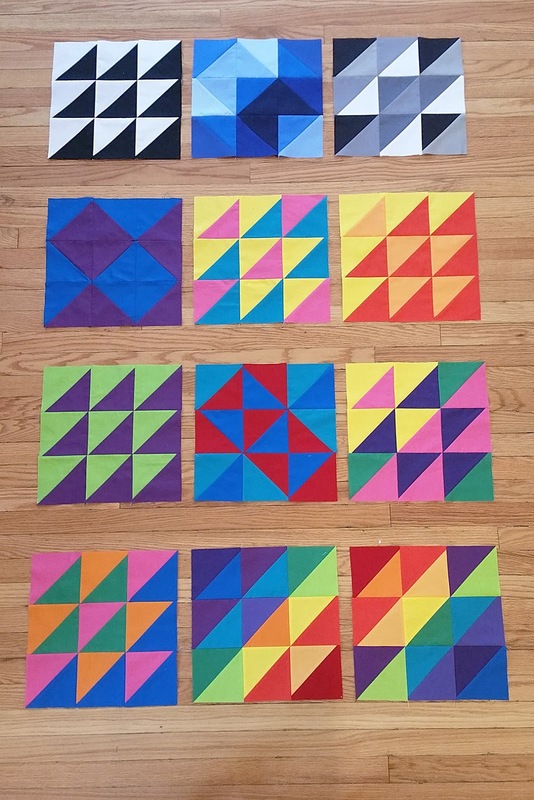 I played around with the samples to find an arrangement I liked, and joined them together with some slightly off-white fabric as a background. Then I folded it up and stashed it away. For awhile - a long while! When I got the top out again, I sewed side panels on to finish it off. 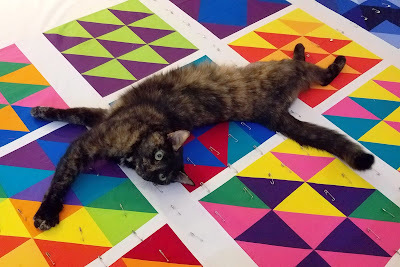 I hung the top on my design wall to make sure it was all good before moving on to quilting (here's Bea Arthur just hanging out with me, the quilt top behind us). While the top was up there I noticed the side panels were a whiter white than the sashing used to stitch the blocks together. Which looked horrible. 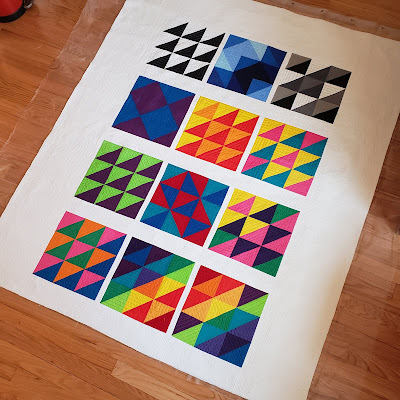 So I picked the stitches out of the side panels and set the top aside for another day when I could focus on trying to match fabrics. 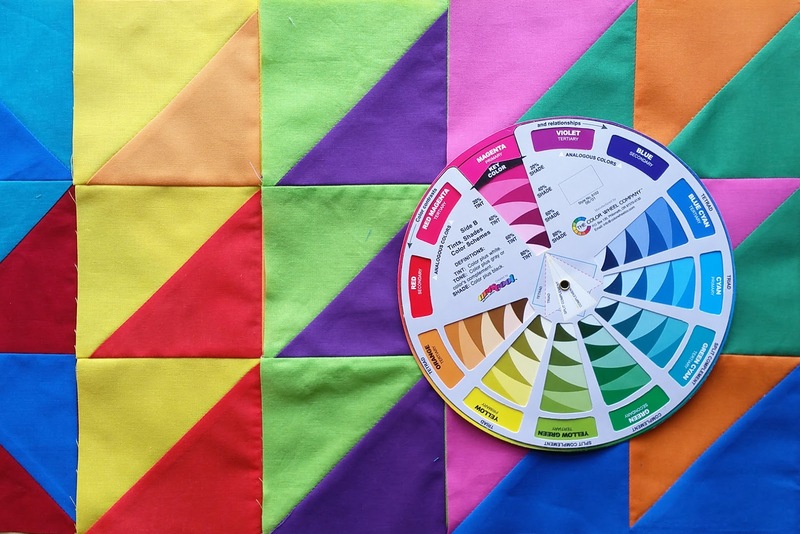 Months later I did look for a more suitable match, but couldn't find the exact shade of off-white to match. 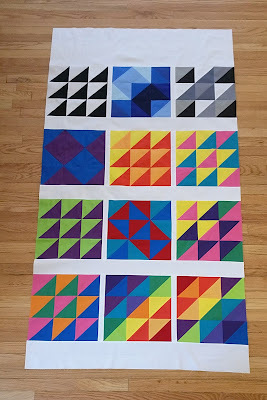 I settled on a warm white that was close enough, and knew I might be able to address the color difference later on with quilting. 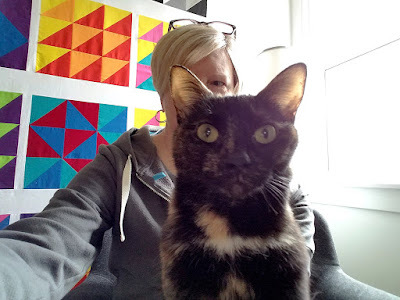 On to basting, always with my trusty studio assistants there to lend a helping...furry paw! 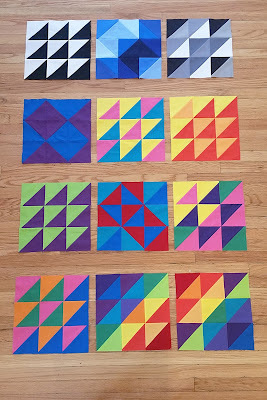 And again this project was set aside for months, as I didn't have a clear idea of how to attack the quilting. 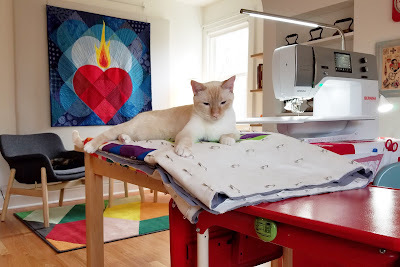 However, it made an excellent bed for Sir Isaac, who often left behind some fur and drool (which is why I washed this quilt as soon as I could!). 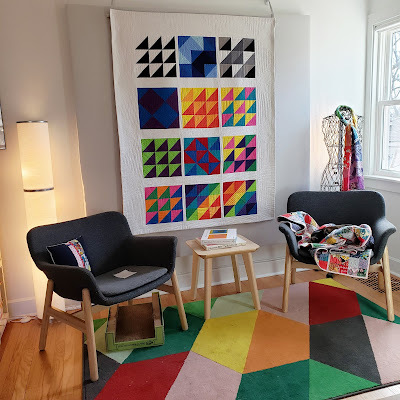 I started quilting with an idea of creating geometric lines over each patchwork square, but after getting about 1/3 into the project I realized it wasn't working. 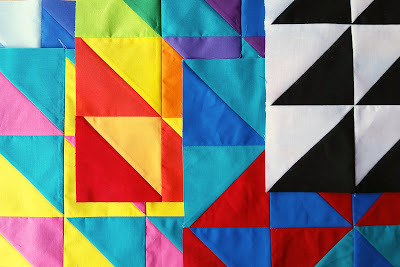 Back to picking out all the stitches to start from scratch with a new plan for quilting. This meant ripping out ALL the quilting stitches, taking the layers apart, pressing it all to try and remove the holes from stitching, and then re-basting it all back together again. This time, I added 1/2" lines of stitching to each patchwork square, mirroring some of the shapes but taking some in different directions. 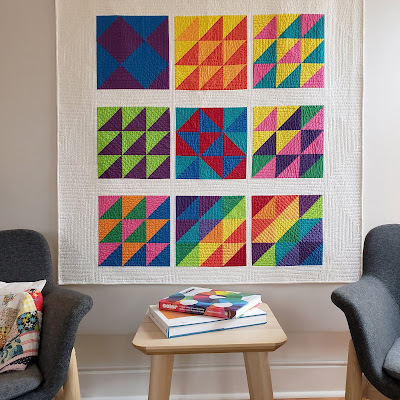 Each of the 12 patchwork squares is quilted with a different design. To help camouflage the slightly different off-whites in the center and on the sides, I stitched the inside off-white with a cream colored thread to make it warmer, and I stitched the outside panels with white thread to tone-down the warmth. 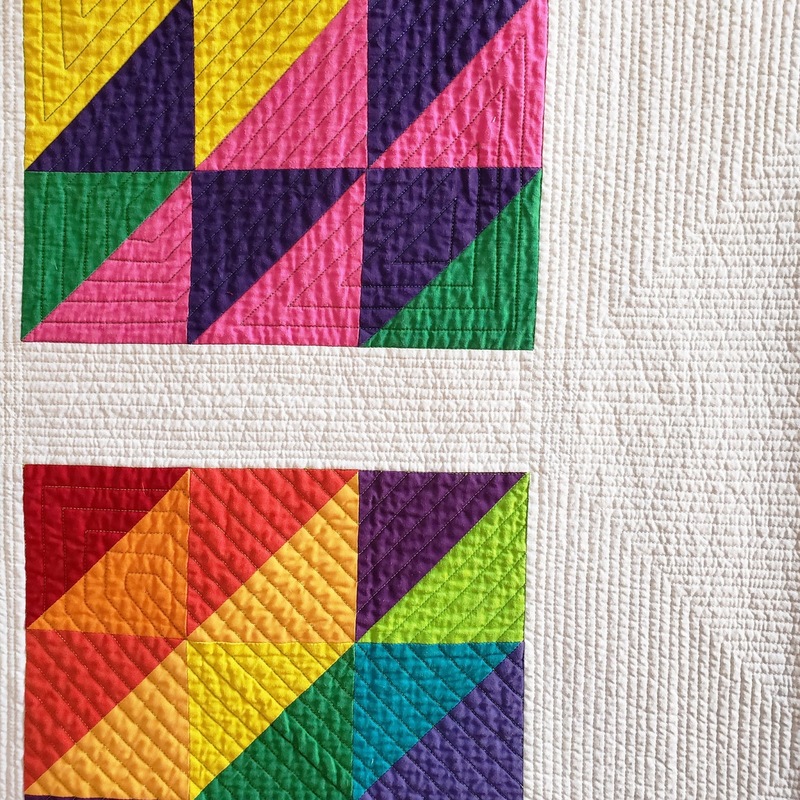 It actually worked quite well, and it's very difficult to see a difference after quilting. Phew! As soon as quilting was finished, I washed the quilt to remove some of the cat hair and drool, and set it straight to dry before blocking and trimming. 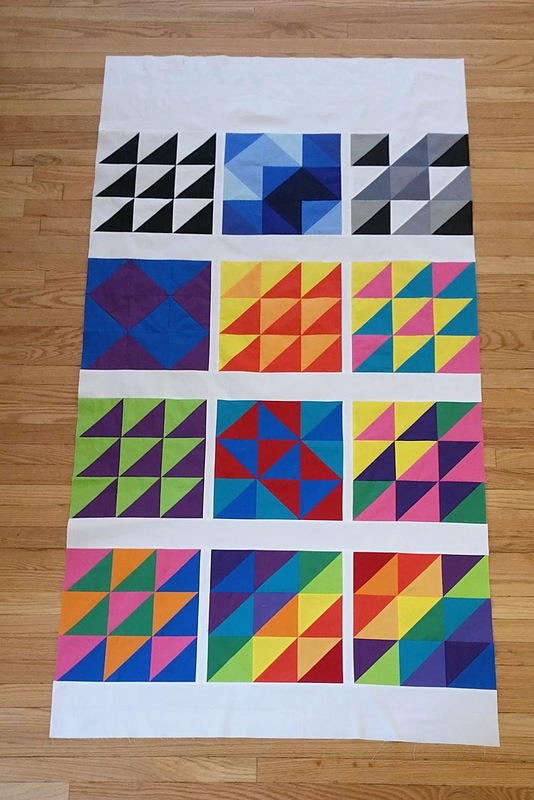 My first attempt to finish the edges of the quilt was to add a facing, but the facing ended up creating too much bulk at the edges, and created a shadowed edge that I really, really hated. 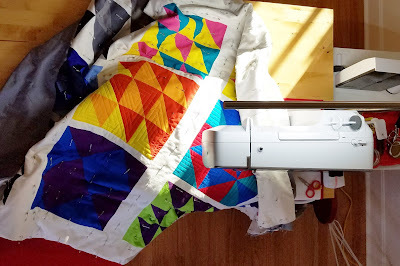 So, again with the seam ripper, I picked the stitches out of the facing and added a very narrow binding instead. Which was exactly what this quilt needed. Because it's been washed, there's lots of nice texture throughout. 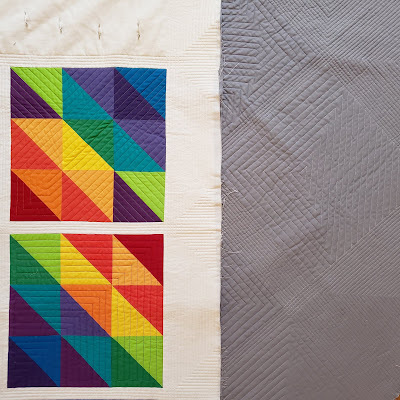 I love the crinkly, puffy look to a washed quilt. I think the washing may have also helped to blend the two off-whites even better as well. 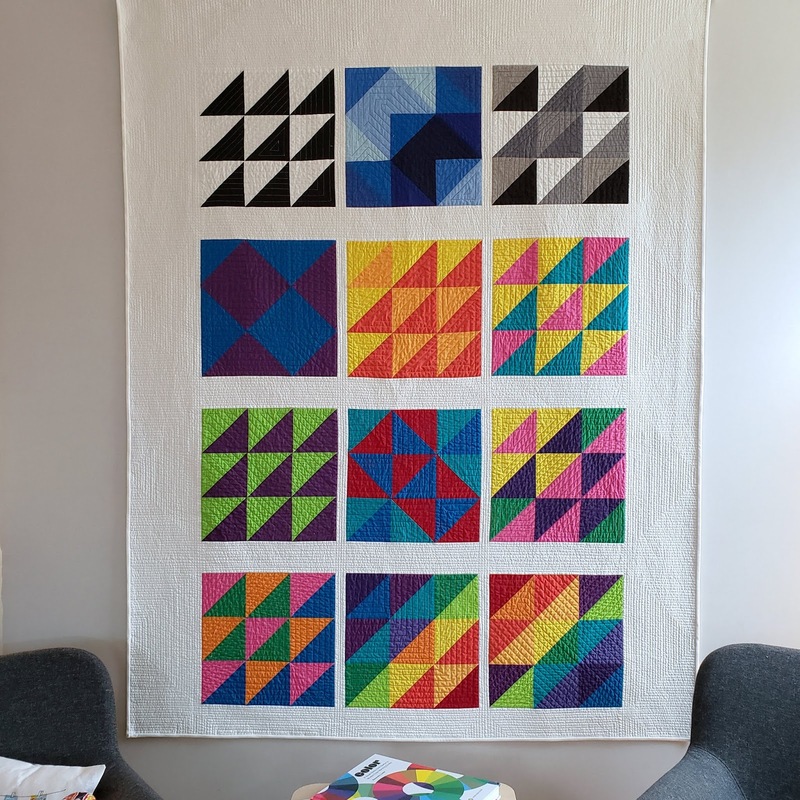 So happy to finally have this project finished, it means I can move on to something else! 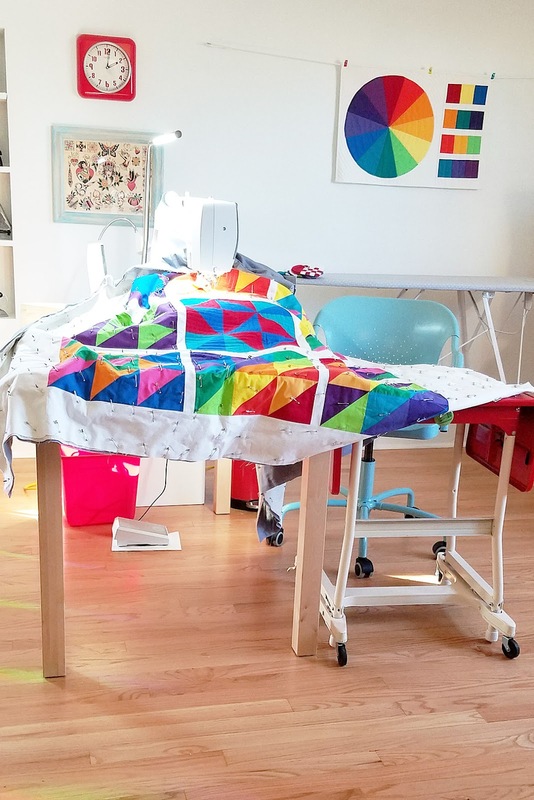 The challenges with this quilt were realizing that some things I tried along the way weren't working, and I needed to spend the time to make it right (instead of just finishing it in a hurry). In a way, these frustrating road blocks forced me to put this project aside several times - because having to un-do hours and hours of work was driving me crazy. Still, now that it's finally done, it's a good thing! It's a lovely quilt. I like how you worked in the black and white. Sometimes it takes some ripping to get it right, but I am always glad when I do. I also like the crinkly look of washed quilts.